If you want to have an idea of what football looked like before the FA codified the game in 1863, thus beginning the modern game of association football—otherwise, and correctly known as soccer, no matter what your favorite Euro snob says to you—a good place to be today would be Ashbourne, England. 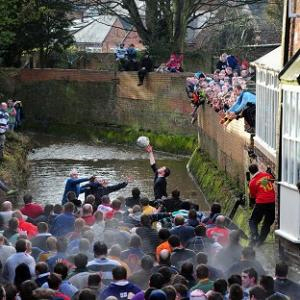 For Ash Wednesday is the occasion of the second of the Ashbourne Royal Shrovetide Football games, the first taking place on Shrove Tuesday, better known in the US as Fat Tuesday. The Ashbourne Games use the word “Royal” in the title because the Prince of Wales (later known as King Edward VIII for about eleven months because he abdicated the thrown since he scandalously wanted to marry an American divorcee, so giving way to King George VI—otherwise known as Colin Firth) attended the games in 1928. Prince Charles the Present continued the “royal assent” when he attended the games in 2003. Both attended the Shrove Tuesday game. Variously called medieval football, festival football, folk football, mass or mob football, these games date from at least the Ninth Century. Their origins are unclear. The Romans certainly brought their game of Harpastum with them when they occupied Britain from the middle of the First century through the beginning of the Fifth century. And there is some evidence that some form of the football game La Soule or La Choule may have been brought to Britain as a result of the Norman Conquest in 1066. The earliest English account of the ball being kicked—probably from the 12th century but the exact date is unknown—describes “Four and twenty bonny boys” who “were playing at the ball.” Of one of the players, the account says, “he kicked the ball with his right foot”. What did the soccer’s ancestors of look like? The term “mob football” probably gives you some idea of what these early football games looked like. There were few rules and likely to be many participants. Depending on whether the game was played in an urban or more rural setting, goals might be hundreds of yards or even several miles apart. The ball might be kicked, carried, punched or thrown to be moved. If, indeed it was a ball that was being moved. The still existing game played in Haxey, Lincolnshire on the twelfth day of Christmas uses something called a “hood,” a leather cylinder inside of which is a thick piece of rope. Teams might be geographically based: one neighborhood against another or one town against another; craft based: coopers against, say brewers; or school based: students in one college against students from another. Goals might be scored by advancing a ball past a particular boundary line such as the threshold of a public house or by touching the ball to a landmark. One account describes a goal as being scored when the ball is kicked into the bell tower of a steeple. Games might last for hours and would end with the scoring of a goal. The lack of rules necessarily led to injury and destruction of property. Property destruction seems to be the prime motivation behind the many attempts to ban mob football, which begin as early as 1314 in London, and continued over the next six centuries as more and more of Britain became urbanized. With urbanization, and the growth of a moneyed class that had time for leisure, came the development of more formal rules about how to play. By the end of the 15th century, accounts of football begin to mention features that resemble aspects of soccer, notably that the game is exclusively a kicking rather than carrying game, and the use of dribbling. By the early 16th century, accounts mention specialized footwear for playing football. By the end of the 16th century, accounts begin to mention small team sizes and the use of referees. By the 17th century, manuals on how to play football begin to appear that describe tactics—including how to properly foul an opponent—the placement of goals and the use of goalies. 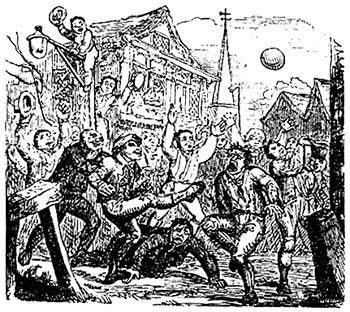 Meanwhile, traditional mob football continued to be played in its many idiosyncratic forms. The ball may not be carried in a motorized vehicle. To score a goal the ball must be tapped three times in the area of the goal. Play begins at 2pm when the ball is thrown—or “turned up”—into the crowd from a specially built plinth. Traditionally, Play could continue until midnight but an agreement with the police in 1967 means the game now ends at 10pm. In 1991 a rule was introduced whereby a game is judged to be void if the ball goes missing for more than an hour, mainly to deter attempts to smuggle the ball to goal. 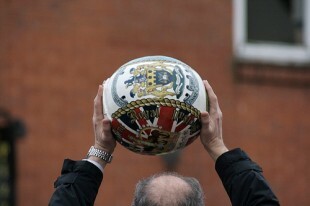 The Ashbourne ball, larger and flatter than a standard soccer ball, is made of leather filled with cork shavings to help it float in the Henmore Brook. Local legend says the ball was originally a severed head tossed into a waiting crowd by an executioner. The ball is rarely kicked. Rather, the ball is typically advanced in what has been described as a “moving brawl,” a scrum of players called a “hug” in the language of the game. When the ball is released from the hug, which is known as a “break,” specialized players known as “runners” try to get the ball to advance it as far as possible toward goal. Sometimes, a goal is not scored in the course of the game. On the rare occasions when a goal is scored before 5pm, another game is commenced, much to the delight of all. After a goal is scored, the ball is painted with the name and design of the scorer and is theirs to keep, although many give it to be displayed in one of the pubs associated with either team. Last week’s Shrove Tuesday game was one of those rare occasions when a tie actually occurred. “Blue skies provided a bright backdrop to Jim Boden’s 2pm turn-up, watched by thousands of spectators, and the Down’ards led the march from the word go, eventually taking the ball all the way to Clifton at 4.50pm,” reported the Ashbourne News Telegraph. But the Up’ards soon managed a goal of their own. After a 5:40pm turn up, “taking the large crowd of staunch spectators unaware, the Up’ards were capitalizing on the darkness.” By 6:35pm, Richard Goodall had scored the equalizer. Long may the game be played. Great article & YouTube video! is ti odd that i really, really like the idea of this game and want to get one started here? Everytime I do research into the origins of soccer, I think the same thing.